Hey Deedee®, India’s only all-women last mile logistic services company announced its foray into an all-women cargo logistics for the first time in India to do last mile and mid mile deliveries. Hey Deedee® has taken a step towards entering the bulk and bigger parcels delivery and mid mile delivery segment by adding their Hey Deedee® women drivers towards the cargo services. The company has been growing by leaps and bounds providing solution to the e-commerce companies for their last mile delivery. Recently, Hey Deedee successfully raised pre-seed funding of $ 500,000 from Metaform Ventures LLC of an undisclosed sum of valuation. The funds are going to be utilized for expansion of footprint, further gaining bandwidth and build technology. They intend to grow from current four cities to 10 cities in this calendar year 2018 and launch their four-wheeler warehouse to hub deliveries with an all women drivers team. 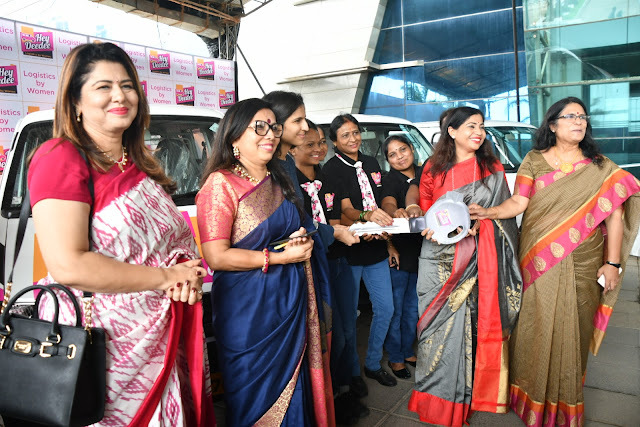 The occasion was graced by Dr. Sonia Sethi, IAS – Ex Transport Commissioner (Govt of Maharashtra), Mrs. Shweta Shalini, Spokesperson, CM office, Ms. Avani Davda, CEO, Godrej Nature’s Basket and Ms. Sapna Bhavnani, famous hair stylist, Mad-O-Wat. The first five women drivers of the four-wheeler cargo vehicles were flagged off by the dignitaries. To ensure that the women drivers are ready, women undergo an extensive 60-day training. By building and engaging a community of trained and certified women riders and drivers, the desired goal of this intervention is to positively impact the employability of women in relatively high paying services, the safety of women customers when using transport other than their own; working in alignment with our PM’s vision of transforming India into a safe haven for women, and also road safety in India. With a mission to train and employ 10,000 women by 2018, Hey Deedee aims to become the largest solution provider for hyperlocals and offers last mile delivery services within the city through its hub and spoke model. Hey Deedee® is an all women logistics firm based in India. It provides a platform to mobilize, assess and train women to become riders and drivers and gain employability. It is India′s first all–women instant parcel delivery service and cargo service. The all–women fleet is a group specially trained by Hey Deedee® (a unit of Zaffiro Learning Pvt Ltd [ZLPL]), which aims to empower underprivileged women by skilling them in two-wheeler or four-wheeler riding or driving and soft skills and guaranteeing them a job on its Hey Deedee® platform. All these women belong to families, which are below the poverty line that earn only Rs 1 lakh, annually. Empowering the women by employing them, doubles the entire family’s yearly income and removes the unfortunate ‘below poverty line’ stigma. Hey Deedee® also aims to provide employers with quick and efficient access to well trained and dependable delivery agents. Hey Deedee® delivered record 250,000 parcels till date for alliance partners Amazon, The Curry Brothers, The Bohri Kitchen, Subway, Herbivore, Shophop, Brijwasi, Pizza Hut, Ecomm Express, Ziptown, Spicebox, Everyday Gourmet kitchen, Pitaburg, Birdy’s, Snackboxwallah, Godrej Nature's Basket, Fresh India Organics. Some of the past clients include Pizza Hut, Subway, Heribvore, ZipTown, Brijwasi, ShopHop and thousands of retail customers.